The next simple outdoor wedding location is the Sweet and Simple at a privately owned Bed & Breakfast that has two sites: one is indoors and the other is outside in a round tree house gazebo. Indoors is a cozy Victorian drawing room with fireplace mantle, lit candles, music, one of the owners to take photos with your camera and includes minister fee for just $129. 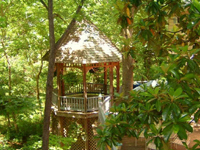 Outdoors is a round gazebo with hanging ferns and flowers under the shade trees and overlooks a small wooded ravine. It's located at the end of the deck and is about 12 feet above the ravine where a groundhog is sometimes seen peering out his home by a log, plus we often have deer crossing the woods and always birds and squirrels. 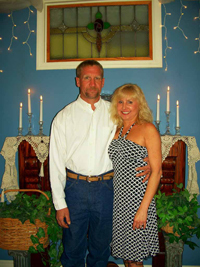 This site includes music, one of the owners to take photos with your camera and minister fee for the same price of $129. If the weather isn't cooperating, we can always go inside as there is never more than one wedding going on at the same time. 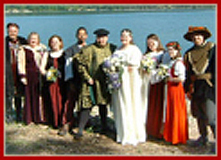 The maximum number of guests (not counting the bride and groom) is 6 and that does include babies, kids and adults. 2 night minimum stay is required at an additional cost on availability of rooms, suites, or cottage.